My side project is a small business called Closed Mondays. For my day-to-day, I am a freelance commercial photographer, which, to most people, sounds like a great creative profession. However, I needed a creative outlet from it. After doing photography for a few years and really getting into commercial work, I felt like I was losing touch with my most creative side. 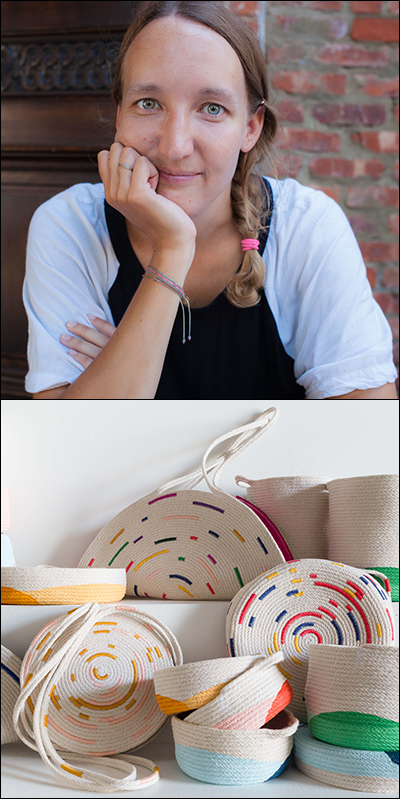 I ended up getting a studio in Williamsburg that would be able to work for both businesses and started experimenting with handmade items between photo gigs. I gave myself several hours a week to do “fun work” as I call it. I was making some of my own clothes, trying out weaving and embroidery—just doing whatever felt right for that day. That’s when I discovered how satisfying making the rope baskets was. Part of me is really lucky in that my full-time career is freelance because it gives me some flexibility, but the other side is that freelancing is already stressful because it’s quite a roller coaster. So I used the flexibility to my advantage—during editing days or slow weeks, I would work on my side business. It has actually helped me to stay calm and no longer panicky when work is not flowing. Instead of panicking, now I just make baskets and work on marketing them. I have a side project to have something that’s totally mine. No clients or art directors adding their creative input. The whole thing is just what I want to do. It sounds selfish, but for me, it’s totally necessary for my creative-self. I also believe it has made my other work better because I am happier now. Diptych courtesy of Bekka Palmer.